The Ratu River Expedition is a scientific documentary written and directed by Isaac Kerlow. 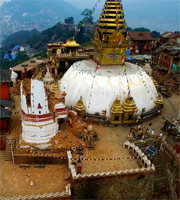 This is a film about earthquakes in Nepal and it features the research of the Structural Geology group at the Earth Observatory of Singapore. The goal of this research is to better understand the behavior of tectonics activity in the region in order to be better prepared for future episodes of natural hazards.